Bf 109G-6 serial number 19839 emergency landed near Nakskov 9/10 1943. The aircraft belonged to 9./ JG 54 and was coded Yellow 10. T/o Schwerin ? Op: Feindflug. Feldwebel Fritz Ungar emergency landed the Bf 109 near Arvlund about three kilometres southeast of Nakskov on the island of Lolland at 15:30 hours. 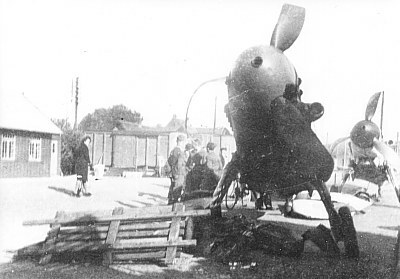 The forced landing was due to lack of fuel and the Bf 109 was 30% damaged while the pilot was inharmed. The Bf 109 was dismantled and taken to the railway station in Nakskov where it was loaded on train wagons. Suorces: RL 2 III/1194, LBUK, Rodeike via Helme.